FORT WORTH, Texas (Nov. 27, 2014) – All three quarterbacks who were named finalists for the Davey O’Brien Award on Tuesday will be competing in key instate rivalry road games beginning Thursday in week 14 of the college football schedule. Trevone Boykin’s fifth-ranked TCU squad will travel to Austin, Texas, to face a tough Texas defense on Thanksgiving night to kick off week 14. On Saturday afternoon, Dak Prescott takes center stage for No. 4 Mississippi State in an Egg Bowl game against No. 19 Ole Miss. Capping the weekend will be Marcus Mariota of No. 2 Oregon in a Civil War road game against Oregon State. 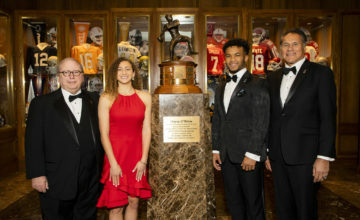 Throughout the season, the Davey O’Brien Award has been highlighting the best weekly quarterback matchups as the race for the oldest and most prestigious national quarterback award continues. 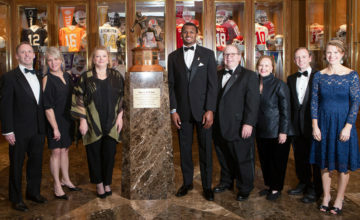 The 2014 Davey O’Brien Award winner will be announced on The Home Depot College Football Awards airing Thursday, Dec. 11 on ESPN. Trevone Boykin has guided the Horned Frogs to a 9-1 record and a No. 5 ranking in the latest College Football Playoff Rankings. The native of Dallas, Texas, currently is third nationally in total offense at 356.9 yards per game. He has thrown for a school single-season record 3,021 yards and 24 touchdowns, while rushing for 548 yards and seven scores in 10 games. In addition, Boykin is eighth nationally in both passing yards per game (302.1) and points responsible for per game (18.6). He is on pace to become just the third quarterback since 2009 to average over 300 yards per game passing (302.1) and 50 yards per game rushing (54.8). Dak Prescott’s Bulldogs (10-1) are fourth in the most recent College Football Playoff Rankings and earlier this year moved to No. 1 for the first time in school history. He currently ranks fifth in the nation in points responsible for (216) and sixth in total offense (327.7). For the year, Prescott has thrown for 2,714 yards and 23 touchdowns and rushed for 891 yards and 12 scores. The junior is the only Football Bowl Subdivision (FBS) player listed among the top 20 nationally in both passing touchdowns and rushing touchdown, and is the only player with at least 2,700 passing yards and 750 rushing yards. 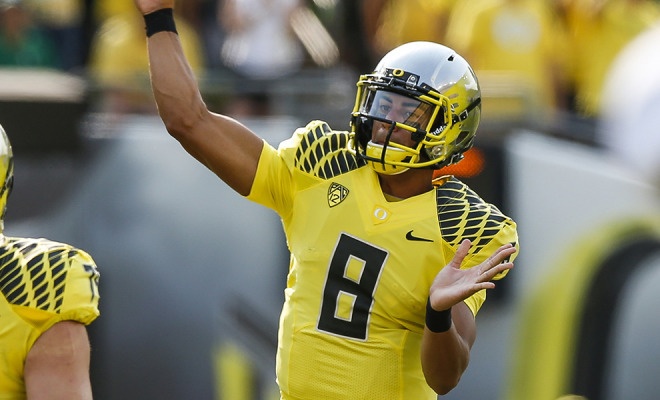 Marcus Mariota’s Ducks own a 10-1 record and are second in the latest playoff rankings. 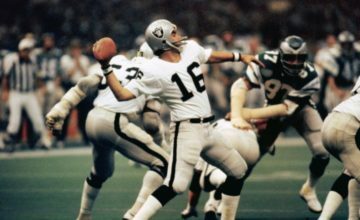 He has passed for 3,103 yards and 32 touchdowns against just two interceptions, while running for 597 yards and nine touchdowns. The junior tops the country in passing efficiency (185.2) and points responsible for (252). In addition, the native of Honolulu, Hawaii, is third in passing touchdowns (32), fifth in total offense (336.4) and eighth in completion percentage (.680). He is the sixth player with 9,000 passing yards and 2,000 rushing yards in a career, a list that includes Davey O’Brien Award winners Robert Griffin III (Baylor, 2011) and Tim Tebow (Florida, 2007).